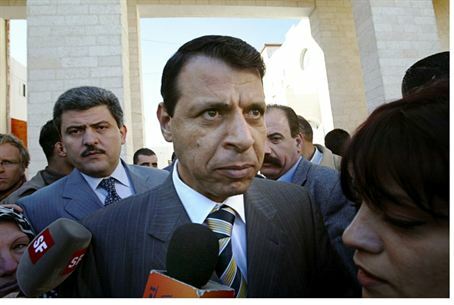 Fatah strongman Muhammad Dahlan is being investigated by PA for allegedly helping send an ship of Israeli arms to Libya's Qaddafi. The Fatah movement, led by Palestinian Authority President Mahmoud Abbas, announced on Tuesday that it has launched an investigation over allegations made by the rebel forces in Libya, who had claimed that some prominent PA officials had helped send anship to Libyan leader Muammar Qaddafi. The PA-based Ma’an News Agency reported that the rebel forces currently battling Qaddafi’s regime said they seized Israeli arms that were smuggled into Libya. Other media reports quoted the Transitional National Council as saying that Fatah Central Committee member Muhammad Dahlan was involved in sending the weapons. An official spokesman for the Fatah Central Committee stated that these allegations are serious and must be examined. He added that the Central Committee will take all the necessary measures to investigate the matter. The speaker clarified that this matter is against the principles of the Fatah movement, and hurts the interests of the Arab people. The speaker confirmed that Dahlan’s name has come up as one of the parties involved and that he has been suspended from the Central Committee’s meetings and is under investigation. Dahlan has denied the charge. This is not the first time that Dahlan has been banned from Fatah: In December, scores of his followers were arrested and government institutions were instructed not to cooperate with him. The reason that was then cited for his suspension was suspicion that Dahlan is trying to topple the PA leadership, starting with Abbas. Abbas and Fayyad see him as a threat. Last November, Dahlan, who is a rabid hater of Israel, had his diplomatic privileges revoked by Israel. After the signing of the Oslo Accords Dahlan founded and for years served as head of the PA’s Preventive Security Service in Gaza. He was then considered a potential successor to Abbas.